Born February 2015. Died November 2015. It had grown from seed to be above the fence. There would probably be fruit to eat in two months. And then it was cruelly killed. a storm knocked it over, but it still had roots in the ground and could have been uprighted. However a lorry just drove over it, and that was the end. other papaya live on – some are flowering or have a couple of small fruit – which will fall off while still tiny. Later fruit will grow to maturity. mock orange died while I was away – lack of water? Well, that’s the bad news out of the way. It still rains most days or evenings – for a relatively short time. So we have some cloudy periods and some sunny periods during the day. Canna Lilies coming up. I transplanted 15 from one pot to two. So far eight are coming up. I hope the others sprout sometime. trying again to grow papaya in a pot. 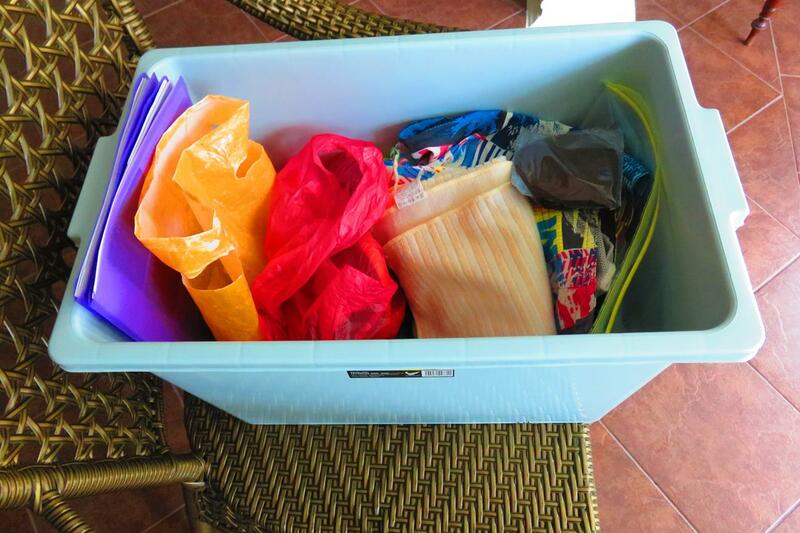 Packing for travel – my latest method worked! I am just back from a trip. Instead of hours packing, this method took me less than 30 minutes a few days before the trip, and 10 minutes just before departure from home. Then another 20 minutes to ensure the pre-packing for the next trip was done, once I got back. Total, less than one hour. And a lot less stress. I’ve been travelling all my life. From literally a few weeks old. I guess my parents did my packing at first. But for decades I’ve been doing my own. And I am still rubbish, that is to say, inefficient at it. I don’t like doing it, and I dither and take hours, even though I have a detailed list. At one stage many years ago I had a Kombi van – and I had most of my gear for camping in plastic rubbish bins permanently stored in the van. Friday night after I got home it was just a matter of grabbing some food and heading off into the country for the weekend. That worked OK.
Usually I start packing a couple of days before the trip, just in case I find there is something I have to buy, or foreign currency I should change. A problem is that there are some things that I only have one of, and those I am using right up until I leave – electric razor, phone charger etc. So I am trying something new. I have modified my packing list so that I have a three sections: A prepacked section of things I will always take – which requires buying some duplicates such as an extra toothbrush and so on; a packing section of what I must pack for this trip – and this would vary depending on the weather etc. ; and a last minute section which I will pack 15 minutes before I leave, as I cannot have duplicate phone chargers etc. This is my list for the trip to Sri Lanka – reclassified with my new system. I used everything I took, and wasn’t lacking anything. It seems the haze has gone, and we’ve been having some beautiful sunny days – often with rain in the later afternoon. This morning is glorious. So now my body seems to have shifted into recovery phase. While my symptoms during the hazy period were a certain vagueness, and sometimes worse, as previously noted, now it’s a bit different. I have bouts of vagueness still, itchy eyes, runny nose and a headache. And I never get headaches normally. And an upset stomach. I had done some cupping on my back and neck, and this releases toxins, so the symptoms are more acute as my body is presumably detoxing faster. Last week I suffered for three days, and then it was gone. So far, this is my first day this week. Hopefully it will soon be all cleared out. The other day in the supermarket I thought I’d lost it. I parked my half-full trolley and returned after five minutes. It wasn’t there, so I was confused as to where I’d put it. This was worse than the usual haze vagueness symptom. Having looked around unsuccessfully it occurred to me that maybe I wasn’t the problem. I spotted a trolley somewhat near where I thought I’d left mine, so considered the possibility that someone had taken mine by mistake. And indeed someone had – I found a lady happily wheeling away my groceries, and pointed out to he where what was presumably her trolley was. Phew. I am pretty healthy, and live a health life, and nevertheless this is what happens to me from the haze. The occurrence of this year after year is just not acceptable.